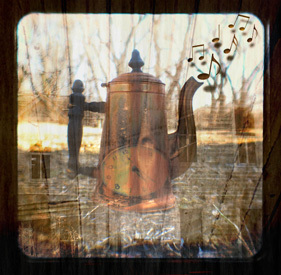 ...two more... - Jill Ruth & Co. I just wanted to show you two more spool Christmas trees that I made and sold at the show on Saturday. It's kind of hard to see in the picture, but the bottom spool (the trunk) has black thread on it. I'm rather fond of Christmas in plaid. I must say I'm surprised at how many spools are different heights. 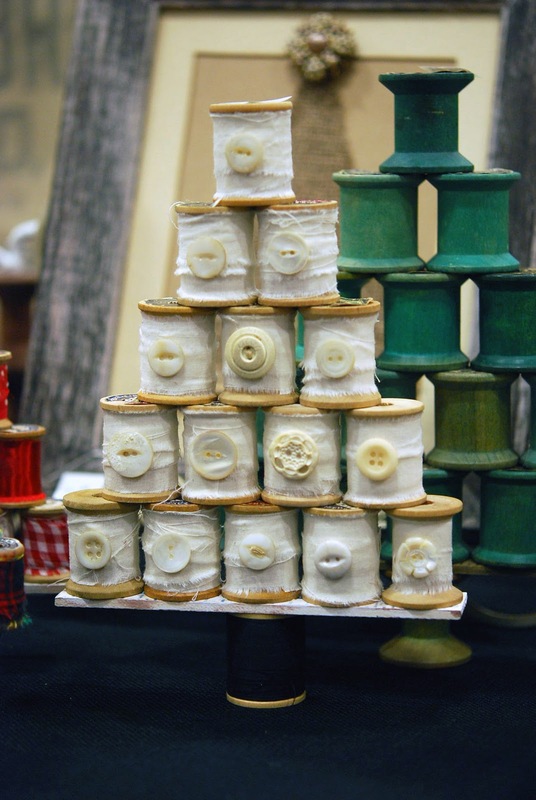 I have a lot of spools, like seriously a couple boxes of them and I had to sort and sort to find enough of the same height for each tree. For each of these I tore fabric strips and glued them on the spools. The one peeking out from behind was done with each spool a different pattern of red. Why not green? I don't know. I just saw my red scraps and really wanted it to be red. So, red it was. I hope you all are having a great week and enjoying the preparation for the upcoming Holidays! They're so pretty! I really like the white one! I hope you're enjoying all of the upcoming holidays prep and creativity. 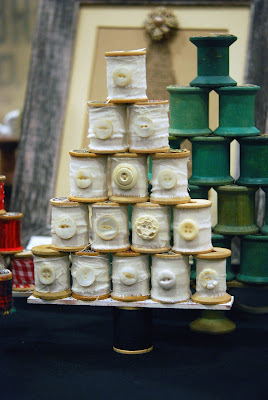 Love these...what a wonderful way to recycled wooden spools! ;-D Have a Happy Thanksgiving with all of your family!!! What a great idea, they are wonderful... I have a thing for sewing stuff and this is great. I love the white ones and the buttons are a nice. 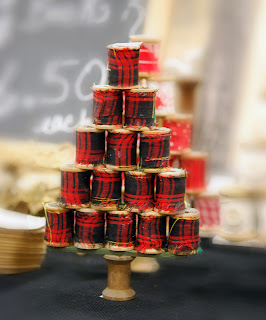 I'm loving those spool trees! So creative! These are adorable! I can totally see why you went with red--cheerful and fun. love love love the buttons and thread one !!! A wonderful idea! I like the extra touch the buttons give. Glad the show gave you some new contacts. I absolutely love it!! so clever! !